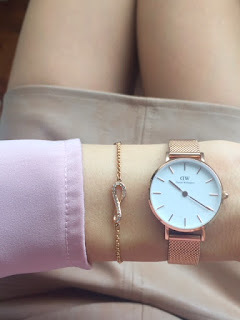 I have been wearing my new Daniel Wellington watch every day since I bought it. I am sooo happy petite watches are on trend this season, as the size really suits my small wrists and arms. Plus, the smaller face and slim rose gold band looks elegant, making it suitable for both day and night wear. Furthermore, the white face against the rose gold band is so fresh, and wears well with almost everything I pair it with. Given the warm temperatures, I have been wearing a lot of light and bright clothing hence, this watch has been the perfect finishing touch to my outfits. I purchased mine from Myer and the style is called Classic Petite Melrose, size 28mm. It also comes in the black face.